A Dockerfile is a set of instructions for building Docker images. An image is the basis for a container. You can think of a running Docker container as an instance of a Docker image. (See this Stack Overflow question for more discussion.) The set of instructions in the Dockerfile is what allows this process to be automated and reproducible. The FROM instruction tells Docker to build the image on top of the publicly available image called adamliter/psiturk:latest, which is an image that contains the latest version of psiTurk. docker build -t <YOUR_USERNAME>/psiturk-example . The docker build command is used to build images from Dockerfiles. The -t flag allows you to specify the name of the image. If you ever intend on making this publicly available on DockerHub, you should replace <YOUR_USERNAME> with the username for your DockerHub account. If you donâ€™t have a DockerHub account and/or donâ€™t intend to ever make it publicly available, itâ€™s still a good idea to replcae <YOUR_USERNAME> with something. You could use the same username as the account on your Linode server that youâ€™re currently signed in to. Finally, the . at the end of the command just tells docker to look for a Dockerfile in the current directory. After this runs, youâ€™ll now have a Docker image containing psiTurk and a prespecified place for where you ought to mount your experiment files. Letâ€™s move on to generating and setting up the experiment files. Letâ€™s break down the docker run command, starting from the back. The part at the very end of the command (<YOUR_USERNAME>/psiturk-example) is the name of image that is the basis for the container that youâ€™re instantiating and running (remember, a container is a running instance of an image). So, whatever you named your image in the command above, youâ€™ll want to make sure that it is the same name here. The next part is the -v flag. This is short for --volume, and it is what allows you to map a directory on the host folder to a directory inside the container. In this case, $(pwd) is being mapped to the folder /psiturk inside of the container. $(pwd) is a command that evaluates to your current working directory, which should be something like /home/<YOUR_USERNAME>/psiturk-example. The next part from the back of the command is --name psiturk-example. This one is pretty straightforward. The --name flag allows you to specify a name for the container. In principle, it could be whatever you want it to be. It doesnâ€™t have to be related to the name of the image (which is <YOUR_USERNAME>/psiturk-example), but it is nonetheless often convenient to give the container a name that is related to the image, which is why Iâ€™ve named the container psiturk-example. Working backwards still, the next part of the command is --rm. The --rm flag simply means that the container will be automatically removed when it is exited. This helps reduce clutter so you donâ€™t accidentally end up with a bunch of running Docker containers that youâ€™ve long since forgotten about. Lastly, the -i and -t flags to the docker run command are related, so I will talk about them together. The -t flag allocates a psuedo-TTY, which basically just means that you are given a shell where you can execute commands inside of the Docker container. The -i flag keeps the STDIN pipe open if you detach from the running Docker container, meaning you can reattach to the container and continue executing commands in that same shell. This will create a directory called psiturk-example, which contains the experiment files for the example experiment that ships with psiTurk. After doing that, go ahead and disconnect from the Docker container by either typing exit and hitting ENTER or by hitting CTRL+d on the keyboard. You should now be back at a shell prompt for your Linode server. If you run the command docker ps to show all containers, you wonâ€™t see any containers since the container you were just in was configured to remove itself (--rm) when you disconeccted from it. So did we lose the files that we just created inside of the container?! Nope, those files live on the host computer, your Linode server. This is because we mapped the folder ~/psiturk-example on your Linode server to the folder /psiturk inside of the container. All changes inside the container appear on the host machine, and vice-versa. The folder ~/psiturk-example/psiturk-example is what contains the experiment files for the example experiment that psiTurk automatically generated. Letâ€™s go ahead and make one small edit to the config.txt file in that folder. In the config.txt file, thereâ€™s a line that says host = localhost. Iâ€™ve never had any luck getting psiTurk to work with this default setting. Instead, weâ€™re going to change this line to say host = 0.0.0.0. We are now finally ready to try out the example experiment! To do so, restart the docker container. Note that the command this time is going to be slightly different! The command is almost the same, except that this time, youâ€™re mapping $(pwd)/psiturk-example on the host computer to /psiturk inside of the container (instead of just $(pwd)). The /psiturk directory inside of the container should contain the experiment files; you donâ€™t want to have the experiment files nested one directory down. 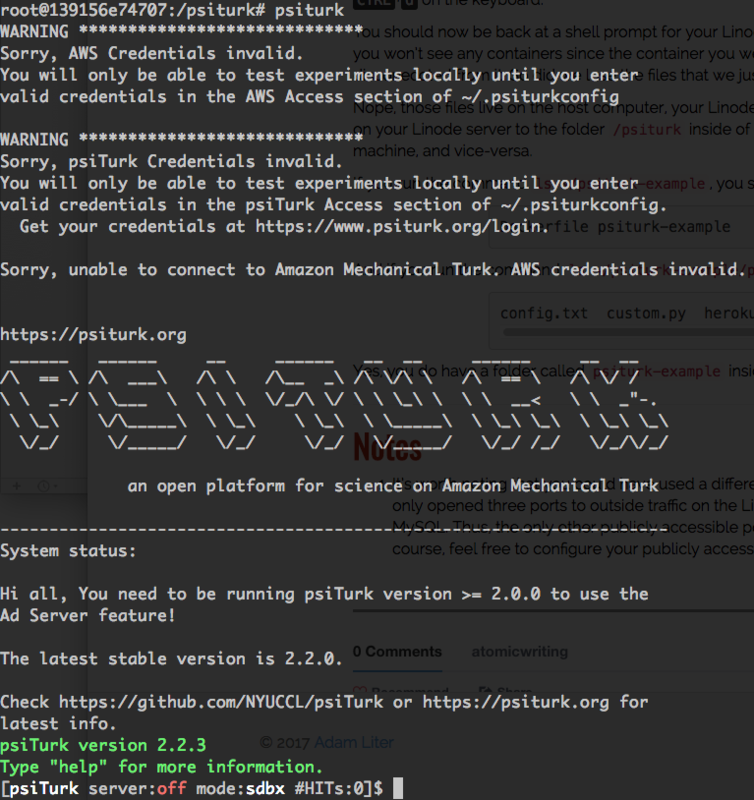 So we want to map the nested psiturk-example directory on the host machine to the /psiturk directory inside of the container. Again, this tutorial series assumes familiarity with how psiTurk works, so if youâ€™re not familiar with the psiTurk shell, I suggest you spend some time reading the psiTurk documentation. We still need to set up a MySQL Docker container and hook it up to the psiTurk experiment, which will be covered in the next post. Then hit CTRL+d twice in order to exit the psiTurk shell and then the Docker container.